Retailing of alcoholic beverages in Canada and elsewhere has traditionally been controlled by government agencies, such as liquor control boards. Privatizing this retail sector has been a recurring political issue since at least the early-1990s when the provincial government of Alberta implemented a major privatization scheme, selling off its entire network of publicly-owned and operated liquor retail stores to private businesses. A decade later, liquor retailing in Alberta’s western neighbour, British Columbia (BC), also underwent a major ownership shift, although less dramatically, by greatly expanding the allowable number of privately- owned stores while retaining the majority of its public outlets. In contrast, Alberta’s eastern neighbour, Saskatchewan, maintains public control of liquor retailing. 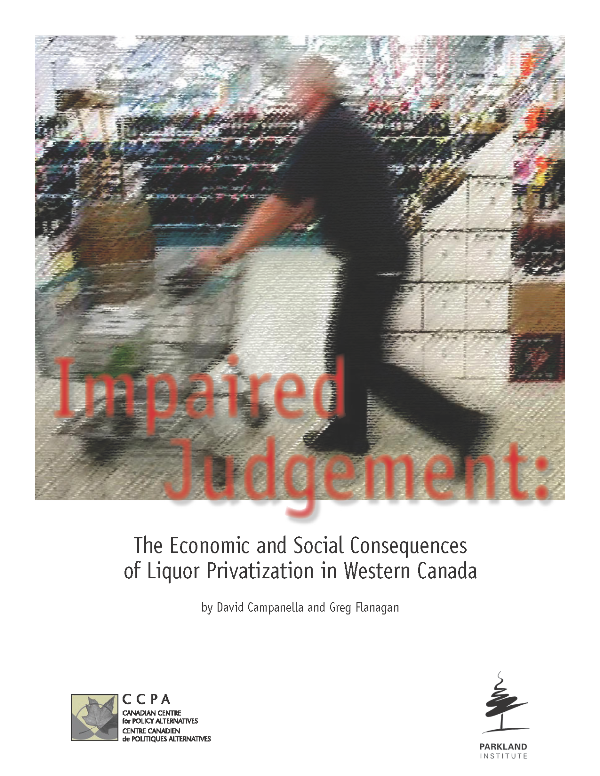 With the aim of more fully understanding the consequences, if any, of liquor retail privatization, this report assesses the merits of the differing liquor retail ownership models existing in western Canada based on government revenue, prices, and public health. It is often claimed that private liquor retailers will supply consumers with alcoholic beverages at cheaper prices. To test this hypothesis, this study conducted a small, informal price survey of a few commonly consumed beverages across the three types of liquor (beer, wine, spirits) in Saskatchewan, Alberta, and BC’s public and private stores. In contradiction to the claim that privatization leads to less expensive alcohol for consumers, our survey found that BC’s private stores almost consistently averaged the highest price out of the four groups, and stores in Alberta the second highest. Overall, the publicly-owned stores in BC had the lowest prices for the items measured, followed by the provincial retailer in Saskatchewan. Another common argument in support of liquor privatization is the supposed financial benefits to the government of selling its assets (liquor outlets) and reducing its expenditures (operating liquor outlets), while maintaining revenue from a tax on liquor sales. Under privatization, the liquor tax would require different administration. The following report measures whether the effectiveness of the tax in accruing government revenue was affected by ownership shifts in Alberta and British Columbia. The results were not favourable for Alberta. In 2011, despite having the highest per capita consumption of the three provinces, Alberta had the lowest per capita revenue from liquor sales. Strikingly, the tax revenue generated per litre of alcohol sold in Alberta has declined dramatically in the years since privatization. By not maintaining the 1993 level of tax revenue per litre of alcohol sold, the Alberta government has foregone nearly $1.5 billion dollars. BC has in the past had a higher level of consumption and higher per capita revenue as compared to Saskatchewan. In 2011, consumption rates were nearly the same in these two provinces but BC had more revenue per capita. While BC’s tax effectiveness has remained relatively stable over the period under study, it has seen a modest decline since shortly after the provincial government launched its privatization initiative in 2003. In contrast, Saskatchewan’s liquor tax effectiveness, although somewhat lower than in 1993, has been on an upward trajectory since 2004. Critically, the revenue governments accrue from liquor sales are not a windfall; indeed, the liquor industry is rarely a net earner for governments when the costs of managing alcohol consumption are included in calculations. In Canada, liquor prices are too low to allow governments to recoup all of the costs related to the public health and social consequences of alcohol consumption. In 2002, with alcohol-related costs brought into the picture, Canadian governments lost between $3.6 and $10.7 billion on alcohol sales; Alberta, between $93 million and $1.1 billion. Researchers estimate that the BC government lost nearly $62 million from liquor sales in 2008 alone. As a wide body of research has found that higher per capita consumption leads to higher rates of alcohol-related social ills, a financially-sound liquor policy that prioritizes the well-being of the public would seek to minimize any cost imbalance by increasing liquor tax revenue and curbing consumption. The Saskatchewan government achieved this goal in 2011, when compared to the previous year higher liquor taxes resulted in $9.4 million of additional tax revenue and a reduction in sales of 135,000 litres of alcohol. Research has clearly established a trend that increased access leads to increased consumption which leads to increased public costs and harms. According to the World Health Organization (WHO), the most proven and effective methods for controlling the health consequences of alcohol consumption include limiting the physical availability of alcohol through minimizing the density of retail outlets and the hours of retail operation, as well as restricting the access of minors. Our study found that the retail privatization experience in both Alberta and BC contravene these policy prescriptions. Limiting sales in pursuit of public health through fewer stores, hours of operation, or potential customers runs counter to the profit motive that drives private liquor retailing. A publicly-owned system, on the other hand, has no such incompatibility of incentives. In the years since privatization began, outlet density in Alberta and BC has increased 73% and 57%, respectively. Saskatchewan, in contrast, has had a reduction in outlet density over a similar time period. Although Saskatchewan consistently had the highest outlet density of the provinces, its population is much more rural and dispersed which would skew the results upward. instance, liquor stores in Alberta are allowed to remain open until 2 a.m, including on Sunday, a day on which hours of operation are constrained in Saskatchewan and in BC’s public stores. Alberta has a minimum legal purchasing age for alcohol, but the ability of the province’s regulators and private retailers to effectively enforce it has been weak. A 2002 internal audit by the Alberta Gaming and Liquor Commission (AGLC) revealed a province-wide compliance rate of only 18%. Later audits document increased compliance, but this has come at a price: the operating expenses of the AGLC have risen, eroding the province’s net government revenue. Similar audits performed by the BC government have since 2003 consistently reported a much higher compliance rate in stores that are publicly-owned (63%) rather than privately-owned (25%). In Alberta and British Columbia, liquor retail privatization has meant high liquor prices but low government revenue. Further, the increased availability of alcohol and its lax regulation contravene recognized methods for protecting public health. Seeking to boost economic activity by privatizing the liquor industry is a losing game — there are always more costs borne on the general population than the benefits accruing to the government from increased tax revenue, if there is any. Maximizing social welfare is not achieved throughestablishing low liquor prices or increased customer convenience. Managing the supply of alcohol, both economically and physically, ensures the greatest level of social welfare, and evidence indicates a public liquor monopoly is institutionally superior to succeed at this objective.